Genitourinary Pathology, by Drs. 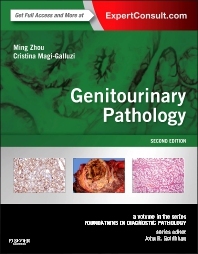 Ming Zhou and Cristina Magi-Galluzzi, a volume in the Foundations in Diagnostic Pathology Series,packs all of today's most essential information on genitourinary pathology into a compact, high-yield format! Well-organized and segmented by type of infectious organism, the book's pragmatic approach complemented by abundant full-color, high-quality photomicrographs and clinical photos, and at-a-glance tables makes it easy to access the information you need to quickly and accurately detect and identify molecular and genetic mechanisms of disease.